A person familiar with the matter told The Next Web that Apple is using a number of checks in iOS 6 to remedy the problem, including password re-entry and event-based disabling of iMessage on compromised devices. The source said that among the variety of checks in place to stop the behavior, the most substantial is Apple's use of push services to force the re-entry of a password on all iDevices when a user resets their Apple ID information, as would be the standard operation procedure when an iPhone is stolen. Another safeguard triggers an iMessage shutdown when a new SIM card attached to a user's phone number is inserted into a new iPhone. This system also takes effect when a handset is remotely wiped. Users first reported the issue in late 2011, noting that stolen iPhones continued to receive iMessages after changing numbers, resetting account passwords and remotely wiping the handsets via Find My iPhone. At the time, it was believed that a remote wipe would not completely break ties with Apple's iMessage service as long as the SIM card attached to the account remained in the stolen device. 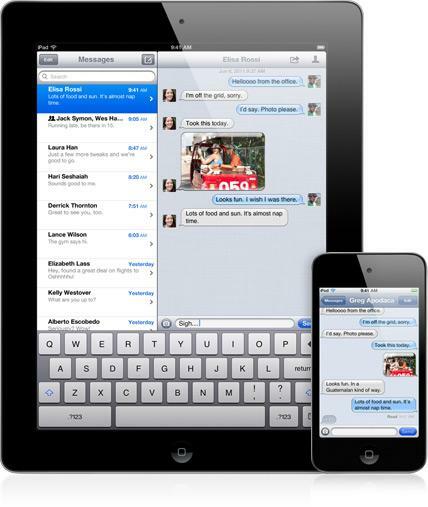 iMessage was released as part of iOS 5 in 2011 as a proprietary data-based alternative to SMS text messaging. A recent report attributed Apple's messaging service as being a major factor in the decline of U.S. texting seen during the third quarter of 2012. While iMessage has enjoyed a high rate of adoption, the service is not without problems. Over the past three months, the iMessage for iOS and OS X has experienced four significant outages, with the last two occurring less than one week apart.